This is a continuation of my post regarding fats, see part 1 here. Omega-3 and omega-6 are essential fatty acids found in polyunsaturated fats. They are essential because they cannot be made by the body and are required for good health, so it’s important that we get these fatty acids from our diet. Omega-3, or alpha-linolenic acid, can be found in rapeseed oil, dark green leafy vegetables, walnuts and seeds. Some eggs are also fortified with omega-3. Oily fish (salmon, mackerel, sardines and herring) are a rich source of a specific type of omega-3 that can help reduce inflammatory responses and blood clotting, thereby reducing risk of heart disease. Current recommendations state 1-2 portions of oily fish per week. Omega-6, or linoleic acid, is found in vegetable and nut oils such as sunflower and peanut oil. There is growing evidence to suggest that omega-3 and omega-6 can help lower our risk of heart disease and some studies show reduced risk of type-2 diabetes and Alzheimer’s disease. Coconut oil; good or bad? There have been a lot of health claims about coconut oil recently, but is it all it’s cracked up to be? Firstly, it should be noted that coconut oil is around 92% saturated fat. As you can see in the graph below, this is extraordinarily high and, using the general ‘rules’ regarding saturated fats coconut oil should be avoided. However, the composition of coconut oil is unusual. A large proportion of the fats found in coconut oil are medium chain fatty acids. …What are medium chain fatty acids? Fatty acids are the bits attached to the glycerol backbone (go back to the structure of a triglyceride explained in part 1). Short, medium and long are terms used to indicate the length, or number, of carbons present in the fatty acid chain. Short (0-6 carbons) and medium chain (6-13 carbons) fatty acids are digested, transported and metabolised more quickly than long chain fatty acids (14+ carbons). This could mean that the high concentration of medium chain fatty acids found in coconut oil results in it behaving differently within the body to most saturated fats. It may also be that the length of the carbon chain changes the impact the fat has on blood cholesterol levels. For example, research suggests that long chain fatty acids increase total and LDL (‘bad’) cholesterol while medium chain fatty acids increase the HDL (‘good’) cholesterol and have a neutral effect on LDL. However, more research is needed to confirm this. What about the other health claims of coconut oil? About 49% of the medium chain fatty acids found in coconut oil is lauric acid. It has been suggested that lauric acid has special antibacterial properties. However, many of the health claims that exist around coconut oil and it’s antimicrobial properties are not yet proven. There are also claims suggesting coconut oil increases metabolism therefore aiding weight loss. Unfortunately, very few studies investigate health benefits of coconut oil, especially when compared to the substantial evidence backing health benefits of mono and polyunsaturates (see part 1). Plus, it is consumed in such low quantities that any impact on microbes or metabolism is likely to be minimal. Having said this, coconut oil is fine to use in small amounts or as a replacement to other oils in cooking. It can add a tasty nutty flavour to food and the presence of medium chain fatty acids may have a beneficial effect on blood cholesterol. Coconut oil, in particular, is a fat that requires lots more research! So what fat should I choose? There are lots of different types of oils and spreads available, and people may use different types for different things. The biggest difference between butter and different types of spread is the saturated fat content. 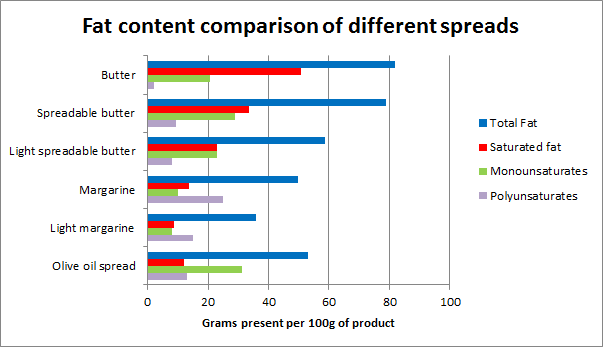 The graph below demonstrates the amounts of fat present in different types of spreads. (Values have been averaged from commonly used brands but can vary). Which oil and spread you choose is likely to depend on lots of things; taste preference, health benefits, cost, habit etc. In summary, to choose a fat low in saturates with higher proportions of mono and polyunsaturates is best for heart health, i.e rapeseed/olive oils and spreads. However, if used sparingly (as any fat should be anyway! ), fats with higher amounts of saturates (such as butter and coconut oil) can be incorporated as part of a balanced, healthy diet. It’s important to remember that all oils and spreads are fats, so whatever ones you use should be in small amounts, especially if you’re trying to lose weight.